Old World New World is a fast-moving and simple game by Victory Point Games. The winner is the first player to get 3 of their units to the scoring locations on the furthest side of the board from where they start, and each player is heading in a different direction to the other players. 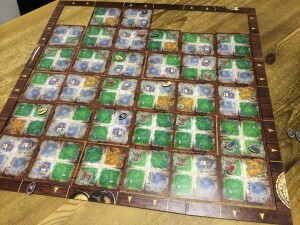 Gameplay is simple: At the start of the game, the board is blank – consisting of just the card frame – but this gets filled-in with landscape cards as the game progresses. Each card has 4 smaller squares on it showing land, sea or mountains – some land spaces have camps on them and some sea spaces have ports on them. On their turn, a player has a hand of cards and can take two actions. An action can be to place a card to fill in any empty square of the board, or they can discard a card to add new units, move existing units, or use a special card for its special effect.